You can eat some really bad Italian meals in Venice. Sounds crazy, right? But it’s not that surprising if you look at the numbers. There are about 60,000 people that live in the historic part of Venice (the island shaped like a fish) and more than 60,000 tourists visit each day. So your chances are not good if you want real Italian food. Venice is not just a destination, it’s also a popular stopping point for cruise ships passing Italy. So it’s filled with day-trippers. Although there is a semi-slow season in the winter, there is no true low season in the city. Even during my visit in January, the tourist routes were still busy with crowds of every nationality taking photos and thumbing through guidebooks and maps. And since there is so much to see all over Venice (it’s not called the “living museum” for nothing), there are numerous streets lined with restaurants for tourists. 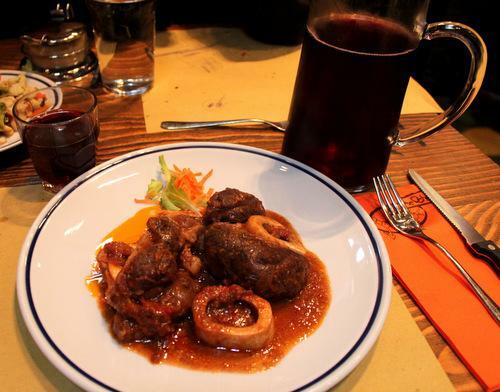 It’s possible to eat really good food in Venice, but it’s not that easy to stumble upon it. If the restaurant menu is translated into 4,5 or 6 languages and hung on the front door, then avoid it. (This is harder than it sounds in Venice). If the restaurant has photos of the dishes in front of the restaurant, then avoid it. If the restaurant offers a “menu turistico”, then try to avoid it. If the restaurant employs someone outside to try to lure you in, then try to avoid it. Venice is pretty small (it takes about an hour to walk across the whole fish, even with all the little bridges), so it doesn’t take long to walk in any direction off the beaten track. If you move away from the crowds around San Marco (St. Mark’s) or the Rialto, you’ll do better. Venetian cuisine is regional and there is great seafood: cuttlefish, baccalà (dried salted cod), spider crabs and every kind of fresh fish. Take advantage of it. 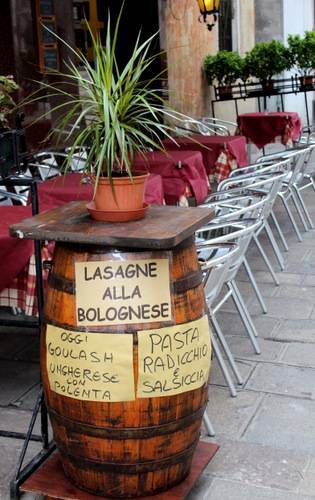 Bigoli (egg pasta), risotto, polenta, gnocchi, tiramisu, sopressa, game meats, eastern spices and radicchio are all important parts of traditional Venetian cuisine. Try to find cichèti, the snacks unique to bàcari (or osterie), the small bars of Venice. Maybe follow a local to one and see what they order. Try not to look like a stalker. It costs more to eat outside than it does to eat inside. It costs more to eat sitting down at a table than it does to stand up at the bar. It is common to charge a cover charge (for eating!) at restaurants. It will be noted on the menu as il coperto. Do research and ask locals on good places to eat near or where you are planning to be. If you are starving and still many bridges and canals away from your destination, then take advantage of a typical Venetian sandwich. It’s standard snack fare, and is two pieces of white sandwich bread (with the crusts cut off) with fillings like tuna, ham and sliced eggs, cheese and vegetables. It costs anywhere from 1-3 Euros for a triangle (half of a sandwich). Try a restaurant in Campo Santa Margherita or Cannareggio, the sestiere where 70% of Venetians actually live. You can see and taste how real Venetians live, eat and shop. A little Italian goes a long way. You will get better service if you make an effort to speak Italian. Naomi Imatome-Yun the author of the “How to Find Good Food in Venice” is a food, lifestyle and travel writer and editor. Her work appears on About.com, USAToday.com, Dining Out and other places. She is currently on an around-the-world trip with her family.